POLAR BEARS AREN'T WHITE AT ALL--THEY JUST LOOK LIKE ONE! THE BEAR'S HAIR IS BASICALLY SEE-THROUGH UNLIKE OUR'S. 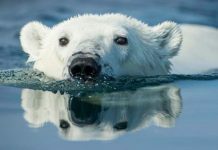 No wonder polar bears appear white for the most part of the year.–except for warmer months when the polar bear’s coat shows yellowish color which is probably due to the oil they take from seals. Compared to adults, young bears display pure white coat one that becomes yellow with age. In captivity however white bears display a shade of green color. The greenish shade is primarily due to the algae that grow inside the bear’s hair. Let’s discuss why are polar bears white all year round? Why are Polar Bears White all Year Round? The polar bear’s fur isn’t actually white at all. It only looks like one. This is because there is no pigment in its fur which can change color. A pigment is a material that changes the color of the reflected material. The bear’s furs are hollow and transparent as a result of which they reflect sunlight from the snow. The reflection indeed gives rise to white color. That is why polar bears remain white all throughout the year. Polar bears are protected with 10-cm-thick hide and dense fur which prevent the animal from getting cold. However the bear becomes overheated when it runs longer. That is why polar bears do not usually run. Furthermore white bears cannot survive in warm temperatures exceeding 10o C (50o F) because of the thick fur. The polar bear’s fur consists of two layers; dense underfur and external guard hairs. The guard hairs look white but they are in fact transparent. Both layers serve as leather jacket for polar bears in order to keep them warm even in minus 30 degree centigrade. Leaving aside the tip of the nose the polar bear’s entire body is absolutely covered with furs including bear’s foot, claws, and powerful legs. The density of furs is the greatest in all Ursids. No other bear species seem to have this much furred body—not even brown bears. Perhaps this is an adaptation to survive in the extreme cold of the Arctic. 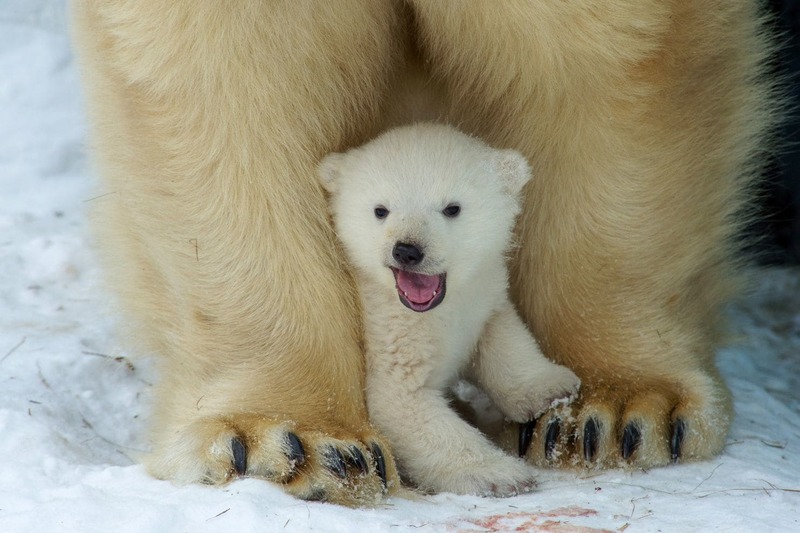 The polar bear’s foot is also furred because it provides an added support to walk comfortably on the slippery surface. 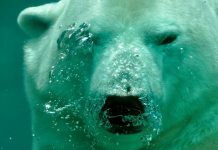 Why Do Polar Bears have Black Skin? Back in 70s scientists studied the polar bear’s adaptations as to its ability to absorb ultraviolet (UV) light. This was thought to be the remarkable discovery since it forced biologists to think that polar bears might possibly capture energy during the absorption of light. 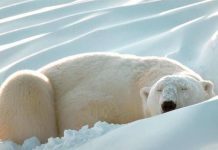 Later findings further suggest the ability to absorb light helps the bear to retain stable body temperature in the harsh arctic environment. The hollow hairs of polar bears (besides attaching algae) also serve as optic fibers in that they provide path to funnel UV light to the skin. It also explains why polar bears have black skin. The black skin is able to absorb such energy without harm. 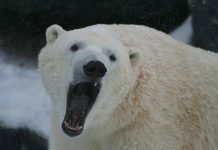 Scientists believe that the absorption of high-frequency energy is indeed an extraordinary adaptation of white bears. Thanks to this characteristic adaptation which has helped polar bears to become Arctic’s deadliest predator—the Great Bear of the North. Sadly perhaps this unique adaptation doesn’t seem to bear any scientific explanation. In the late 90s the scientist Koon found out that the polar bear’s hairs transmit light probably not as efficiently as it absorbs UV light. As the light enters the fur and attempts to go down the shaft, energy is lost or perhaps absorbed, inhibiting much of the energy to get to the skin. What Color is a Polar Bears Fur? 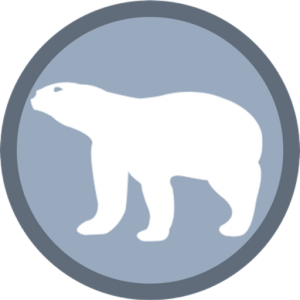 | Why Do Polar Bears have Transparent Fur? Polar bears have surprisingly black skin which is visible when the bear loses hair possibly due to some disease. 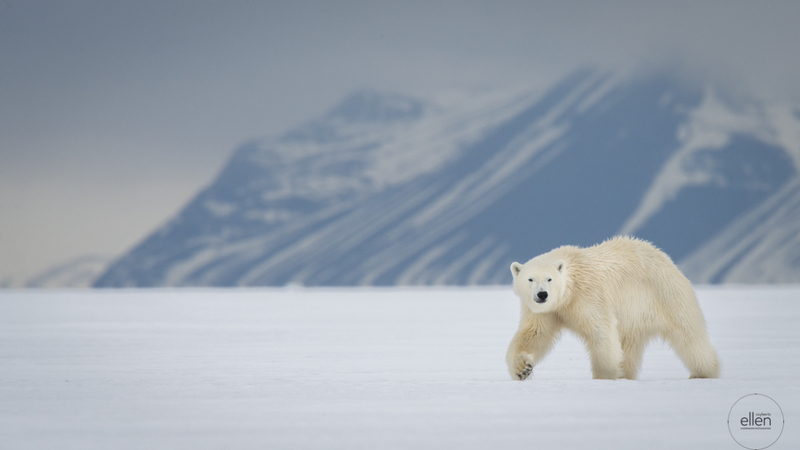 In a bright sunny day in the Arctic the polar bear’s fur looks white and clean. It happens because the fur lacks pigment. That being said, if it lacks pigment the coat must change to any color it gets. As it turns out it does! The fur not only appears white in fact it shows quite a few colors. When the sun rises or sets the polar bear’s coat takes on the yellow-orange hues. 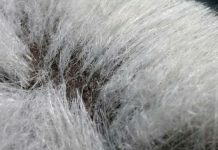 Similarly the fur also plays blue color because sometimes the sunlight while passing through clouds and fogs bring blue light. 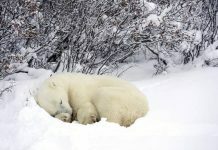 Polar bear’s fur is adapted to take on different colors from the surroundings primarily due to the nature of its hair. The bear’s hairs possess hollow medulla (core) which entertains the impurities. They seem to show pure white coat soon after molting. During spring when the prey density is higher in the arctic waters adult males take on yellowish coat. The off-white or yellow coat is mainly due to the impurities or oil attached to the prey (seals). Polar bears shed their hair in April to May but the shedding continues all summer. During fall the polar bear covers with shorter hair but in spring the hairs grow longer. They have thick underfur and pelt. The furs have varied lengths. Kolenosky G. B. 1987. Polar bear. pp. 475–485 in Wild furbearer management and conservation in North America (M. Novak, J. A. Baker, M. E. Obbard, and B. Malloch, eds.). Ontario Fur Trappers Association, North Bay, Ontario, Canada. Lockwood, Sophie (2006). Polar Bears. Chanhassen, MN: The Child’s World. ISBN 1-59296-501-6. Koon, Daniel W. (1998). “Is polar bear hair fiber optic?”. Applied Optics. 37 (15): 3198 3200. Bibcode:1998ApOpt..37.3198K. doi:10.1364/AO.37.003198. PMID 18273269.